After almost 40 hours traveling, we made it Nepal! Trilok’s dad has actually been in the US for the last few weeks for work. 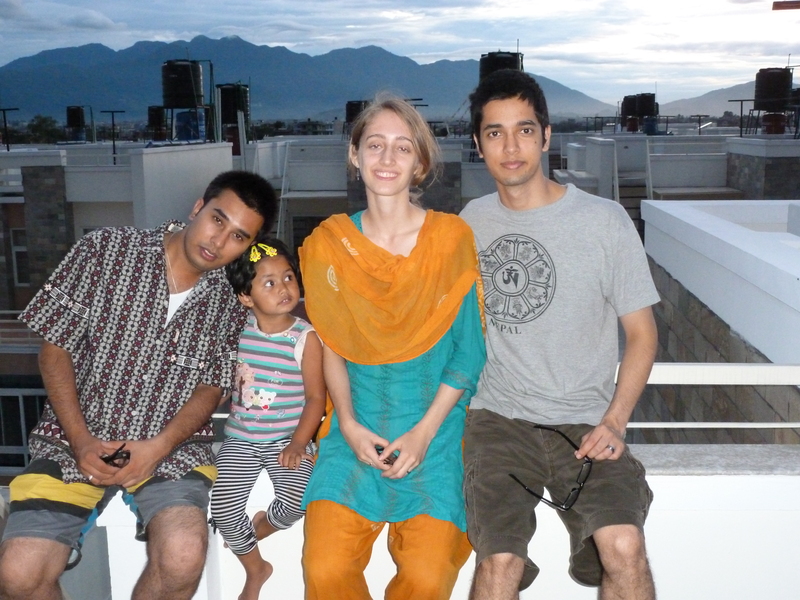 We weren’t able to make it down to New York or DC to see him, but we knew we’d be meeting soon in Nepal. He flew into Kathmandu the same morning as we did (on a different flight), and Trilok’s brother, uncle, aunt, and cousin were all there to pick us all up. I still can’t believe that we’re back. It seems so strange but entirely normal at the same time. In some ways, I feel like we never left Nepal in the first place, but, of course, things have changed. The city feels just a bit more crowded, and Trilok’s brother has been telling us that the government has been busy building new roads around the valley. Bua’s home is also different now. Things have been moved around and there’s a new room that’s been added on the roof. We also have a new member in the family since Trilok’s dad remarried last year. She is a wonderful women who is doing so much to make us feel at home. I expected changes in Nepal and in our home life here, but what I didn’t expect was the flood of emotion I would feel after arriving in Kathmandu. For the last year or so, I’ve tried so hard to put Nepal out of my mind. I think that part of that has been a desire to mitigate the pain I felt about leaving, but it got to a point where I wasn’t even sure I wanted to come back this summer. However, since Tri was traveling here and I wanted to be with him, I knew I would go. I expected to feel sort of indifferent when I arrived, but instead I have felt incredibly relieved. I had forgotten how much Nepal feels like home to me. Of course I also have a home in Philadelphia, where I’m from, and now a home in Boston, where I live, but I can happily say that Nepal is on that list. I had also forgotten how much meaning Nepal brings into my life. I can’t say for sure whether it’s the family that we have here, the people in general, Nepali culture, or the physical beauty (maybe a combination of these things), but there’s something about this place that makes me feel content and at peace and loved. I am very happy to live in the US, but after being in Nepal for just a day, I feel like I have a renewed vigor to work towards a life that allows us to live in Nepal for a month or two out of the year. I don’t want to get my hopes up! But at the very least, it’s nice to know that I will always have a second country to come home to. I keep starting blog post after blog post, trying to figure out exactly what I want to write, but I seriously don’t know where to start. So instead I’m just going to say that it’s been way to long since I posted last! I’m going to try and post a bit more for at least the next few months. Partly because…we’re going back to Nepal for a month in July! I’m super excited to see friends and family and eat a TON of Nepali food while I’m there. Thinking about going back to Nepal is bitter sweet because I know that we’ll only be there for a few weeks, but alas such is life. Tri thinks that after our short visit, I’ll be ready to come home to Boston, and I kind of hope he’s right so that it’s not too painful to leave. I can tell you a little bit about what I’ve been up to for the past however many months. Since last summer, I’ve been working at a learning center, mostly helping kids who have dyslexia. I’ve also been applying to and getting into grad school and taking classes that I needed to get out of the way before I start school in the fall. For the next two years, I’m going to be studying communication sciences and disorders so that I can become a speech language pathologist. As I’ve written about before, my interest in language and communication all started back in Nepal when I was first learning Nepali. In college, I became more interested in communication disorders when I got the chance to shadow a few speech language pathologists. While I was teaching in Kathmandu, I kept asking around to figure out if anyone knew of any speech language pathologists there. Although I did hear of people in Kathmandu hospitals who work with stroke patients on language skills, I don’t think that any of the schools in KTM have speech therapists. Anyway, I’m kind of hoping to do some more sleuthing while we’re there to see if I can meet a Nepali SLP. For the month of June, I’ll be finishing up my last prerequisite classes and getting ready for our trip. I’m so excited to be posting again. I had forgotten how much fun it is to blog! I’ve only ever flown through Delhi before when traveling to and from Nepal, but this time around we got a great deal with Qatar Airways, so we’re flying through Doha. We’ve only got about an hour and half layover before we have to catch a plane to our next stop, but I’m excited to at least get a glimpse of the country from the airport windows. The problem with buying cheap tickets, however, is that you end up paying the price in other ways. While traveling through Delhi, we could take two 23 kg bags each, totaling about 100 pounds per person. 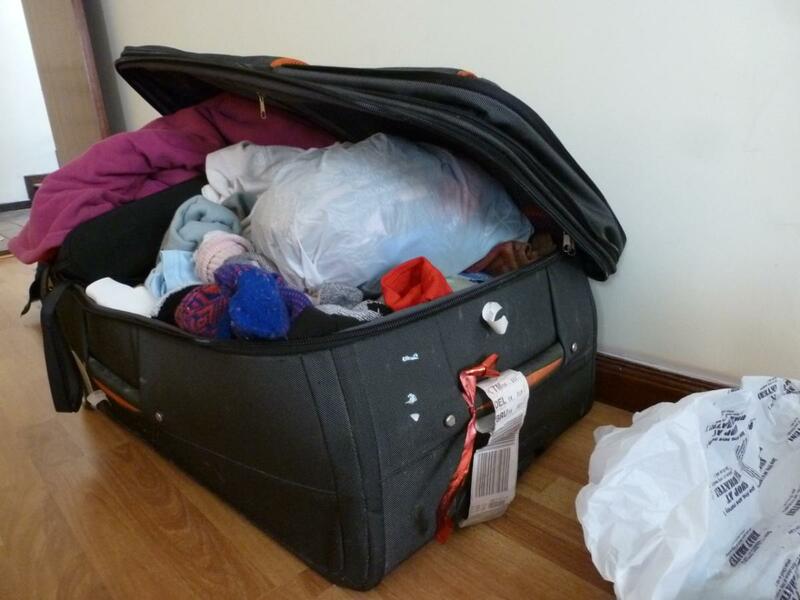 But with Qatar Airways and as economy class travelers, we’re only allowed one bag, each weighing 23 kg. It’s a big difference, and not only do we still have the clothing that we brought to Nepal, but we amassed quite a few things while living here. Why do we have so many things? And why is it so hard to get rid of them? I don’t love throwing things out, but I do have my cleaning sprees where I’ll go through my room and chuck clothing that’s ratty and old and donate things that others might be able to use. But it’s a little more difficult when you’re part of a Nepali family and/or live in Nepal. Most people in Nepal are quite frugal, which makes sense to me, but that also means saving everything, every plastic container, ever piece of clothing, even the ones you don’t use, every gift you’ve ever been given. You can give these things out to people if you don’t want to keep them but there’s no chucking them in a dumpster. I was about to throw out an old sweat shirt that someone had given me as a hand-me-down, but Tri looked at me like I was crazy and said I absolutely could not. I get it. It makes total sense to save things, especially in Nepal where things are expensive relative to wages earned and where there are so many people who are in need of more clothing. But it definitely makes things difficult when you’re trying to move across the world. I think for now we’ll try to stuff our suitcases as full as we can and if we go over a few kg’s, it won’t be the end of the world. Apparently they charge 13 US dollars per kg that’s over the max of 23. Yes, it’s a lot, but our tickets were such a good deal, that it’s not a huge loss. Alright, I’m going to go and tackle my bulging suitcase. Any suggestions on packing techniques? We flew into Nepal last Thursday morning, and it’s been a crazy few days. A lot of memories from being here before have been coming back to me, although it feels very different. For one thing, being here with Tri is a completely new experience. Before I was here as a student studying abroad, but now I’m part of a Nepali family, which brings its own benefits and challenges. It’s also very different without Tri’s mom around. Her absence is hard to swallow, but we’re getting by.